High walls and heavily buttressed defensive towers surround the great monastic complex of Sucevita, giving it the appearance of a fortress. Founded in 1581 by Gheorghe Movila, Bishop of Radauti, it was later expanded by his brother, Ieremia, ruling prince of Moldavia, who added massive ramparts and turrets. An elegant steeple resting on a star-shaped base tops the church. Massive eaves protect the outside frescoes, painted by local artists in 1602-1604. Sucevita boasts a magnificent depiction of the Ladder to Paradise. Red-winged angels in orderly rows attend the righteous on a slanting ladder to the heavens, each rung inscribed with one of the monastic virtues. Sinners fall through the rungs and are driven by grinning devils to the chaos of hell. On the south side, foliage entwines the rows of figures in the Tree of Jesse. Following it is the Hymn to the Virgin. Sucevita was a princely residence as well as a fortified monastery. Today, the thick walls shelter a museum presenting an outstanding collection of historical and art objects. The tomb covers of Ieremia and Simion Movila – rich portraits embroidered in silver thread –, together with ecclesiastical silverware, books and illuminated manuscripts, offer eloquent testimony to Sucevita's importance first as a manuscript workshop, then as a printing center. 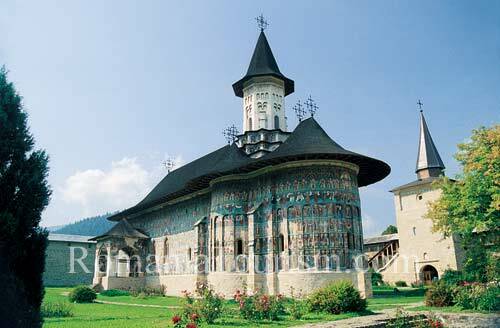 Sucevita was the last of the 22 painted churches of Bucovina and has the largest number of painted images. The western exterior wall of the church is not painted. Legend has it that work stopped after one of the painters fell from the scaffolding and died. All rights reserved. RomaniaTourism's prior written permission is required before parts of this Website may be reproduced in any form. The contents of this Website are for information purposes only and are not to be taken as endorsements or warranties of any kind. RomaniaTourism shall have no liability for errors, omissions or inadequacies of the information contained in this Website or for any interpretations of that information.